There’s nothing like a confined space and two small people with loud voices both competing to be heard. The School Run: Short and sweet. Hmm, short yes, sweet no. Those few short minutes can feel like sheer torture. Is the bickering and banter their way of saying, ‘I’ll miss you or I’ve missed you?’ Whatever the case may be it’s enough to drive anyone batty. The Trip to the Grandparents: similar to the School Run just longer in length. There’s also the added anticipation of arriving. The excitement builds to a crescendo just as we pull in the driveway. My eardrums feel as if they might explode and the grandparents think that a tornado is about to hit the house. It is obvious to all concerned that I have little/no control over my terrors. The Big Day Out Drive: setting out at shortly after the sparrow’s have sung their morning tune and arriving home close to dinner time denotes a Big Day Out. Wherever we may be headed we have a packed lunch, picnic rug, esky and bag (filled to the brim with spare clothes, hats, sunscreen, etc). The expected, ‘Are we there yet’s?’ start when we’re approximately half way there. It’s been smooth sailing the whole way if we don’t have to stop for petrol or the toilet en route. The Great Escape: we’ve prepared for this for weeks but nothing can prepare us for the journey ahead. The car is crammed with half the contents of our house. The tailgate on the wagon will only just close. There’s pillows between the kids on the seat. It’s like we’ve tried to build the Great Wall between them so they can’t touch or see each other. The kids have got numerous things to keep them occupied. A game of ‘Eye Spy’ starts before we hit the freeway. If we’re lucky they’ll nod off (syncronised is heaven) for a while shortly after, ‘Are we there yet-i-tis?’ has commenced. The Solo Cruise: doesn’t happen too often but when it does, Oh Boy! A chance to listen to adult tunes at any volume you please. Window up or down, whatever takes you fancy. And that annoying noise coming from the back of the car? It’s completely gone! Mum’s taxi will be off again in the morning with the boys I love on board. How do you cope with the calamity of children in cars for the quick trip or the long haul? Footnote: After originally publishing this post in February, I decided to revisit it today as it was one of the first ‘pieces’ I wrote that exceeded several lines in length and had some substance. It is also the basis for the idea of my first picture book manuscript. My self-imposed deadline of June 30 is looming. I think my set of wheels needs a car detailer. The words ‘I love you’ are easy for most parents to say to their child. It is a little more difficult with the fast pace of day-to-day life to find time to show kids the kind of love they will most remember you for. When I think back to my own childhood the fondest memories I have are of the things we did not words that were said. I knew my parents loved me because of their actions not from a single spoken, ‘I love you’ even though it’s lovely to hear and I heard it often. Show and tell. In our home we have an unwritten policy that means we try and express our love in as many ways as possible. Children can learn how to sign ‘I love you’ from quite a young age. Another way is just to point to your eye, your own heart and then point to the person you’re aiming your love at. Both of my boys love having their back tickled before being tucked in at night. So after sharing a story, I will tickle their back and write, ‘I love you’ with my finger. ‘I love you because…..’ Simply stating ‘I love you’ can be wonderful to hear. It has even more meaning when there is a connecting reason given to the receiver. The end of the sentence could convey how you feel, ‘I love you because I feel so lucky to have you as my son/daughter.’ You may choose to say something about the child’s appearance, ‘I love you because when you smile it lights up your whole face.’ Receiving compliments can be difficult for adults who have never learned to graciously accept them as children. This one is then two-fold-a compliment and an expression of how you feel all rolled into one. Little things impress little people. Sticky-notes in lunchboxes, sandwiches cut into shapes or heading to the playground straight after school are all little things that are a big deal to kids. Think of something you know your child will appreciate and it doesn’t have to cost a cent to be meaningful. Spend time wisely. Everyone knows childhood is gone in an instant. Blink once and they’re walking. Blink twice and they’re at school. Blink again and they’re getting their license. I know I want my children to enter adulthood with the recollection that I had time for them. That I wanted to spend time with them, share it with them and try as I might, make it stand still. Capture moments, get lost in the moment but don’t miss the moments of time you could have spent with them. Do things as a family. Family time is hard to find for some but so important. There are times when we need to divide and conquer to achieve tasks but ensuring your family has together time is essential. It might be as simple as an adventure in the backyard or as complex as going on a day trip with a picnic lunch. Lend a hand and let them help. Helping children shows your willingness to engage in what’s important to them. Like any relationship it needs to be reciprocal. Allowing them to help you with tasks or involving them in your interests shows them that you care what they think and feel and that yo appreciate their willingness. Model love. Children learn their cues from adults. Demonstrated love will allow them to see how it’s done and put it into practise. Actions speak louder than words. Cuddles, kisses and hugs and lots of them. As human beings we crave touch-the feel of a warm embrace, a kiss from a loved one or to cuddle up together without a care in the world. Not a day should go by when your children don’t feel the warmth of your heart beating next to theirs. Greet and farewell them like a long lost friend. Having children understand that you miss them when they’re gone but be so happy to see them again later helps them to understand that they are important people in your life. Sharing the day’s events when together again is a great way to connect with kids. Remind them constantly. A day without love is like a day without sunshine. 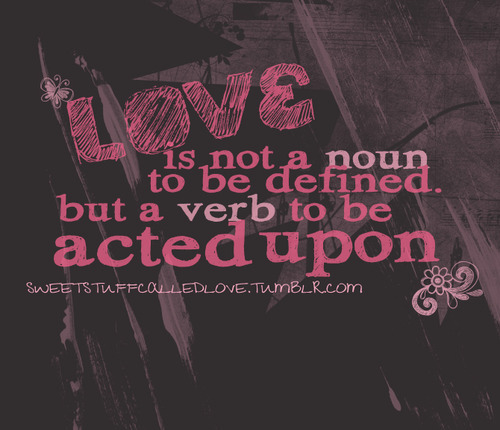 Most certainly, there are many other ways to express love through actions. If you have a way of showing love you’d love to share I welcome contributions. © 2013 Kelly Hibbert, all rights reserved.